Joint Meditations welcomes you to its new home The Collective House. 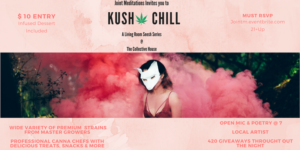 3 LEVELS OF THE FINEST 420 Friendly Business Owners in DC sharing flowers, delicious edibles in a Elegant newly renovated private home in DC, catered to communing with the artist, the elevated thinkers, the free spirit, the cannabis connoisseur. Offering you flower from local growers, delicious edibles from local chef’s, expert cultivators, CBD products and more! $10 @ door.. 420 pastry included.